A delightfully strange and hilarious debut novel perfect for Lemony Snicket and Trenton Lee Stewart fans--the first book in a new middle-grade mystery series that will keep you guessing and laughing all along the way. 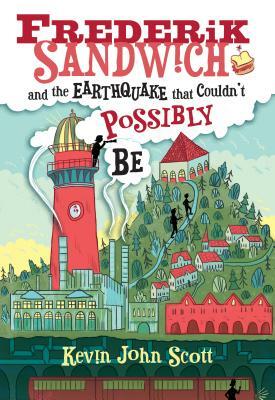 At the age of eleven Frederik Sandwich awakens to an earthquake that couldn't possibly be. His town is nowhere near a fault line and no earthquake has ever been recorded there. But when he questions what could have caused the shaking, he realizes he may have uncovered more than he bargained for. Desperately wanting to know what happened, but not the type of person to break rules or push adults for answers, Frederik is lucky (or not, depending on how you look at it) to meet a mysterious stranger, Pernille. She is the sort of person to break rules and demand answers, and is determined to partner with him to get to the bottom of the mystery. It's a mystery that will lead the two outsiders through abandoned train tunnels, into hidden library rooms, and to the shadowy corridors of City Hall in the dead of night as they try to figure out what could have caused inexplicable rumblings in their small town.